Last year at the conference formerly known as BlogWorld, members of the NMX team had the honor and pleasure of spending most of our time in the New Media Lounge where we could talk with attendees, answer questions, take comments and even offer tips about getting the most out of one’s conference experience. This got us to thinking…what if we offered our brand new attendees the opportunity to have their questions answered ahead of time? What if we got to show them around a bit so they didn’t feel so “new” when the conference starts? A new attendee orientation is born. Learn about NMX from the NMX founders. Receive a description of the different educational content from track leaders and conference directors. Get a map of the show floor, plus tips for making the most of the exhibits from the NMX sales team. Take a tour of the Rio’s conference facility. Receive tips and best practices for making the most of networking, learning and having a positive conference experience from NMX’s community director (Yours Truly). Have questions answered by the NMX team. In addition to the orientation, we’d like new attendees to know we’ll have their backs throughout NMX. Ambassadors: We’re going to be appointing a couple of attendee ambassadors. These ambassadors are long-time alumni who are passionate about NMX and will be available throughout the conference to answer questions and give directions or advice. Wristbands: New attendees will receive wristbands in addition to their badges. We are going to encourage all attendees, speakers, exhibitors to seek out new attendees to make sure they’re having the best experience possible. New Media Lounge: Members of the NMX team are going to be keeping office in the New Media Lounge. We’ll be there to answer questions and also to learn more about all our attendees. We’ll be receiving your feedback, hearing your ideas and listing any concerns. As space is limited, the orientation is only open to new attendees who are already registered or will be registering to attend NMX. There is no cost to attend but we’ll gladly accepts smiles, handshakes and hugs. Please sign up for the new attendee orientation by using this form. Any questions? Comments? What do you hope to learn from a new attendee orientation? Share in the comments. In the meantime, you might be interested in this post by Aaron Hockley with conference tips for introverts. Excellent idea – I could’ve used this when I attended in November. I was totally overwhelmed. @Sherree_W Thanks, Sherree! What are some of the things you wish you knew last year? @debng These are a few things I wish I had known or done. Hope they help. I think I had the “deer in the headlight” look more than once! 3) manage my time better with all of the sessions that were going on. I wanted to attend as much as possible, and it was hard. @Sherree_W This is great to know and will help us to help new attendees moving forward. Thanks so much. I hope you’ll find me to say hello in January. I set up shop in the New Media Lounge so please don’t be a stranger. @debng You’re very welcome. I will definitely find you to say hello. See you in January. This is so very cool. I cannot tell you how many times I have been at a conference where this could have really helped anyone attending for the first time. Your team just keeps coming up with great ideas! @bobWP Thanks, Bob. And as an NMX veteran, what is your advice to new attendees? @debng mmm, besides finding the sessions that resonate with you, connect with people there. Find an empty chair at a nearly full table in the lounge and introduce yourself. Spend some time in the Expo, these people aren’t just selling, they have tons of ideas to share with you. And make sure you find me and say hi! @bobWP Good advice all around, Bob. 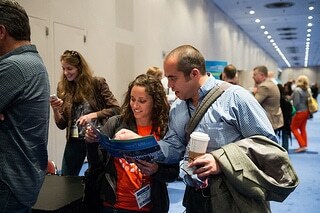 @blogworldexpo Wear comfortable walking shoes, know that you can’t possibly see it all (so prioritize), and have fun! @overcoffeeshow Every year I tell our community to wear comfy shoes and every year I wear heels and my feet are killing me by EOD. @TravelSweeps Thanks for the feedback. You think it’s self-explanatory, or some other reason? We’re buying the registration this week and I will definitely be a part of the new attendee orientation as this will be my first experience on this kind of conference 🙂 Looking forward to it.